Louis Sherry's 12-piece chocolate truffle filled tins were designed in 1919 as a gift for steamship passengers. Our chocolates have been enjoyed by kings and queens, sultans and maharajas, princesses and presidents. Our emblematic gift box is composed of a house selection of exquisite Louis Sherry truffles renown for their creamy texture and exceptional silkiness. A truly delightful gift for anyone to indulge in the pleasure of fine chocolate. 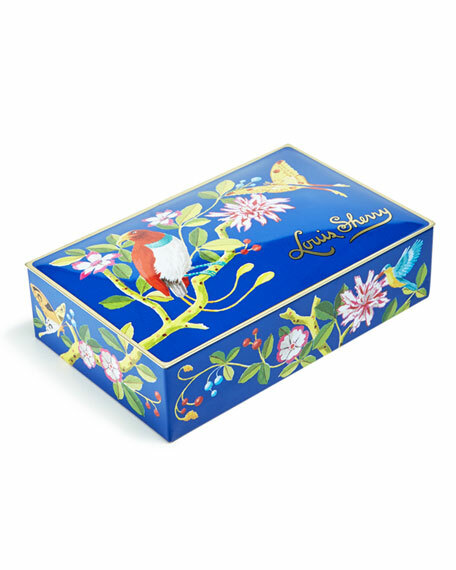 Our Bird & Butterfly tin was designed for us by artist Harrison Howard. 12-piece assorted truffles in bird and butterfly tin. Designer, Harrison Howard was born in 1954 in Bryn Mawr, Pennsylvania. Much of his professional career has been devoted to mural work in private homes, and has included screen prints, panels, easel paintings and watercolors. In the most recent years his focus has been on easel painting and limited-edition prints, often with bird, animal or floral motifs. Tin, 6.3"W x 4"D x 1.75"T.